Magic the Gathering, Hearthstone, Faeria, Eternal. Аггро деки известны, контроли сформированы и наличествуют. Следовательно можно охотиться и за теми и за эдакими чем-то этаким специфичным. Тут это не просто рампа, это смесь с контролем, и с кучей веселых картонок. Опен этим наврятли выиграть, но нажарить ФНМчик - вполне, и устроить море угара. 2 Carnage Tyrant - Несильно дорогой по мане, контролей именно сейчас хватает, большие статы. Мало велью, но и без него в колоде этого хватает. Просто надежный порщик. и иксовый спот-ремувал/лайфгейн здесь не смотрится так дико. 4 Doomfall - Универсальный дизрапт кричей или руки. 4 Hour of Promise - Рамп спелл с велью. Этими токенами не забадаем, но хотя бы почампаемся ход другой. Собственно в основном изза этого спелла в деке много пустынь. так и в сайде пачка, а также россыпь ремувал и прочих пакостей на все случаи жизни. Поскольку рампа, то скастить тютор и его цель в один ход - гораздо проще чем в других колодах. нам просто некуда будет деться в этом формате в этом нынешнем филде. 2 Thaumatic Compass - Рампа и лейтгейм ремувал-лок. Что может быть лучше. 4 Gift of Paradise - Рампа, лайфгейн, колорфикс. Изи. 1 Profane Procession - Экзайл ремувал и винкондишен в одной карте, эффективный, но манаемкий. Собственно что и надо рампе. 1 Sandwurm Convergence - Большой винкон, на который нужен либо специфичный ответ, либо много ответов. То есть в идеале должен постоянно напрягать. Поскольку тот же Тиран умирает от Фумигаций и уходит от Сеттлов. но было бы гораздо удобнее спасаться от наземных. 1 Arch of Orazca - У нас много земель и мы рампа. Велью земли и добор - это наше все. Флуд ми нот лайки. периодически проскакивают вкрапления всех трех других цветов. Поэтому даже с учетом чар земель, эта земля под-Час оказывается очень полезной. 2 Desert of the Glorified - несколько циклящихся пустынь в каждый основной цвет деки. Против флуда и под рампу. 1 Field of Ruin - Тюторится и Часом и черным спеллом. Спектр играющих трансформеров нынче стал еще шире. 1 Hashep Oasis - пустыня в основном цвете. Скорее всего ради того, чтобы иногда можно было “допробить” Тираном или еще чем. То есть “болт” в землях. 3 Ifnir Deadlands - Земля-ремувал. Пустыня. Тюторится. 1 Scavenger Grounds - от Скарабеев, Халков, и Гифтов. Пустыня. 1 Shefet Dunes - Белая пустыня под рампу. Еще одна земля на “допробить”. доп. винконами и зачистками по случаю. 2 Approach of the Second Sun - Если охота или реально выиграть “быстро” без мучений и мытарств. Ищется из сайда тютором. 2 Arguel's Blood Fast - CA, он же card advantage, она же California, оно же преимущество по календарикам на руке. Ну и рандомный лайфгейн сильно по праздникам. 1 Gonti, Lord of Luxury - довольно рандомная единичная копия, даже при тюторе. Видимо просто удобная цель, когда непонятно что брать, или что нужно. 1 Lost Legacy - Убираем вражеские Солнца и Скарабеев. 1 Nezahal, Primal Tide - что-то типо 3го Тирана, но специфичнее и более полезный как источник добора в контроль-миррорах. хотя мироходцы сейчас не самый прям уж ходовой товар в формате. 1 The Scarab God - Винкон всея контролей и просто хороший парень. Без него в 75ми в таком стиле колоды сейчас никуда. 1 Wildest Dreams - Больше и больше велью. Получили велью прочими, подняли все обратно. Гриндить обгриндить. 1 Yahenni's Expertise - Стандартный масс-ремувал в удобных цветах. Плюс в количестве спеллы, которые с нее очень приятно кастить в довесок. 1 Zacama, Primal Calamity - большой, красивый, веселый альтвинкон для матчей где надо больше жира. Все делает, еще очень мило рычит. Ждите больше таких материалов и сравнений нескольких вариантов билдов одного архетипа. Стандарт, Модерн и Легаси. MtG. Pro Tour Rivals of Ixalan and Modern Metagame in general. 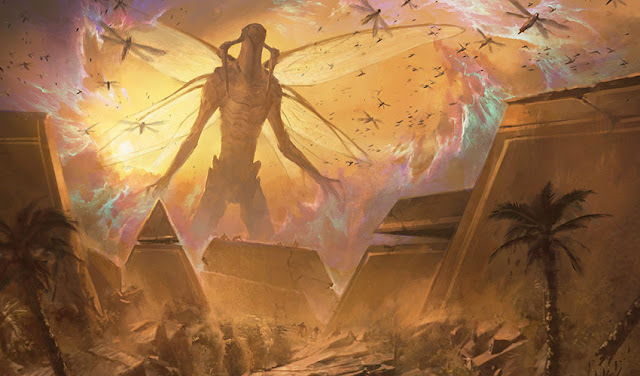 Some pragmatic players might say that Modern is not a format, and there is no metagame there. I tend to disagree and agree to a certain extent. There is a metagame, but it is so wide and complex, that King of the Hill is a very unstable position. The metagame shifts all the time within the field, depending what gets played most at a certain time. because overall one can face both terrible and excellent matchups. Hence, one cannot really tune or hedge against everything and has to compromise. However, it is much easier to calculate your deck choice for an event like a Pro Tour. (Pro Tour Oath of the Gatewatch and Eldrazi menace). My aims here are to make you think and somehow ease the deck choice thinking process for you. that is very unlikely to accomplish for anyone, except for some really rough estimations. and this is also why I tried to add as much statistics as I could within one article. Burn, Affinity, Infect, GR Tron, Grixis Shadow, Jeskai Control, Affinity, U/R Gifts Storm, Jeskai Control, Burn, Humans, Jeskai Control, U/W Control, Burn. Nothing really crazy here, except for maybe Infect. Infect is a good meta deck. It suffers mainly from decks with discard spells and Chalices. While the latter is only a real problem gain, and they have to have it fast, discard spells are much tougher to overcome. All the decks here will be at the PT, but I just grew to hate playing Storm. It is such an emotional roller coaster. You either leave them no chance, or get totally destroyed yourself. Zoo (seriously quite old school Naya Zoo), Grixis Shadow, Lantern Control, Mardu, Merfolks, Affinity, Bant Company. This sort of speaks to me as Control and Anti-Control Top16. With Lantern being anti-control and Merfolks somewhere in the middle. BG Mid, Dredge, Blue Moon, Grixis Shadow, GW Company, Elves, Eldrazi Tron, UW Control. but they all pretty much same traits as for the Classic event. There are same two camps more or less in terms of strategies, though this time aims are reversed. That is aggro and anti-aggro is a bigger trait, than control and anti-control. Dredge, UW Control, Mardu, BG Shadow, Lantern Control, Affinity, Eldrazi Tron, Affinity. First of all it was Team Trios. That adds some limitations. Even though it was Standard-Modern-Legacy, and not just Modern-Modern-Modern. and some risks in terms of matchups are worth taking. I assume was like at the PT to some extent. I mean people likely thought of the “best” decks and gunned mainly against those. I like Dredge, but it is in my view a metagame call, just like Lantern Control. I don’t particularly fancy both in a more diverse field. I quite like all of these decks, with the exception of maybe GR Ponza. Titan Shift could be a very good PT pick, if you happen to dodge most unfair decks. Similar thing with Dredge. Very powerful deck, can still win through hate, but again, dicy in that regard. In terms of risks, I think Affinity has minimal downside in that aspect. Probably best “busted” deck, when it comes to digging out of troubles. Here we enter the zone of very sweet potent decks that are quite meta dependant. If I would want to bring a spicy yet competitive deck to rock the house, I will select something from this pool, or from the next group below. Basically this and next picture is full of decks that can perform either amazingly, or totally badly. Or if you feel like you tend to be the “lucky strike” person, you can take Jund Griselhoalbrand (Reanimator), for instance. WURG here is just Blue Zoo. With corresponding pluses and minuses. I.e. good store play or long-term deck, but never spectacular. but CoCo variant is better versus midrange decks. WUB is Esper Living End. Kind of a middle ground between Jund and Monoblue builds. Cannot say more here. But respect the strategy. W for Monowhite Death and Taxes. Easy deck for newcomers and not that pricy. Typical Weenie that can bring saltage. BRG is essentially BR Hollow One with Vengevine, which are not meant to be cast. I’d say I favor the addition. UBRG is apparently just another take on Dredge. Yes, Boggles should be good right about now. More on that later in the article. Difference between Gw and Gwb Elves is very small, but impactful. Gw can go off with Devoted Druid plus Vizier of Remedies. Gwb closes out with a full set of Shaman of the Pack. I like both packages and myself would try to fit in bits of both. I do like the deck right now a fair bit as a choice for premium events, since among other features it can protect from mass removals and has combos built-in. URG refers to Temur Bring to Light Scapeshift Control with one Damnation. The deck can still perform over long-run, but I think its time has passed. RG version is just better rounded up overall. UW Spirits is just a cheap way to enter the format, especially if you happen to still have all the cards from the past Standard. Merfolks have always been somehow a “secret” sleep-in in Modern. Everybody knows about it, but tend to forget from time to time, and then get punished. It’s like with Dredge in Legacy. Similar thing goes for Skred Red, but the deck itself is way less flexible and hunts more specific victims. From here on out we are looking at very niche decks with few exceptions. And at a few distinct flavors of more common builds. I actually quite like the non-Skred version of Monored Stompy. I don’t see any appealing flaws on paper. There are a few Grixis Control lists out there. The deck is sort of dead right now, but can be just a sleeper. Bans do drop sometimes. The lists look more like about pet cards or comfort zone, than anything real. And then we a bunch of various aggro decks, which are also partially about pet cards and comfort zone or wallet/collection zone. I think that as long as you know the format, the staples, and have clear ideas, you can brew some playable concoctions. It is quite sad to see such decks like some DnT flavor, Infect, Bant Eldrazi and Grixis Delver this low. I have a feeling they might grab a bigger cut at some other periods. Those four are some of the most underestimated decks in the format in my mind. but Shadow builds are just much more powerful overall. Ironworks is a sweet deck, but it never pretended to rise to any prominent level. and see how it compares to the most popular decks online. Jeskai Control, Affinity, Grixis Shadow, Humans, Burn, Green Tron, Eldrazi Tron, UW Control, Mardu, Storm. Actually very close. With little exceptions. And with factors like matchups and pairings and pilots we get a very near picture. I.e. paper forecasts can be to a certain degree be based on current online situation. We are soft of reaching a wheel here. Company decks, Affinity and Burn lose to fast combos more often than not, but kick blue decks. Blue decks keep combos in check. Midrange keeps blue decks. Big Mana decks (Tron, Valakut) keep midranges and some blue decks sometimes. because there are essentially combo decks, that can just beatdown and can often try to grind. But then, the realization of the cycle kicks in. Before the events we covered, we saw a cycle of Big Mana decks on top. Now our statistics show resurgence of Blue Control decks as an answer to that. At the same time, we see more aggressive Company decks, Humans, Affinity and Burn which aim to go underneath all of that. Thus, we are somewhere at the end of that cycle. I think Pro Tour might end up being full of the last three decks and the like. For example, BR Hollow One, which is not as risky or dicy like Dredge or Living End. In which case, Abzan Midrange with a solid amount of hate in the sideboard, should be a fine safe compromise. Lifegain (Prinos, Timely, Scooze), disruption, grindy, grave hate, solid beatsticks, white sideboard cards. Here I would like to take a moment to specify. There are decks that were good, are good, or will be good, depending on the cycle of the wheel. There are Pro Tour decks, Grand Prix decks, decks that should be on top according to the data, and decks that I will pick for myself. My pick for Pro Tour - Abzan Midrange, UW Control or Mardu Pyromancer Midrange. Decks I play in Modern - Eldrazi Tron, UR Storm, UG Infect, Vizier Company, UW Spirits. Decks I like most among my own - Infect, UR Storm. Decks I have played in Modern - every side of the spectrum, including decks that are nearly extinct now. Nearly half of the format. Decks I would want to play - Elves, Amulet Combo, BR Hollow One, Dredge, Monoblue Living End, Monoblue Turns, Monogreen Devotion. Hope you enjoyed this overview and made some decisions more clear for yourself! Stay reasonable and listen to your guts!